How to use the Free up space feature on an Android device, and how to troubleshoot it when it does not complete successfully. The Free up space feature lets you delete local media from your phone while ensuring before doing so that it has been backed up to Jottacloud. Jottacloud for Android works with photos and videos stored locally on your Android device, and photos and videos stored on your Jottacloud account in the cloud. In fact the photos displayed in the Photos tab is a merged list of both local and cloud photos. Only when these 3 steps succeed is the space freed from your device. To free up space for a specific photo or video, simply tap on the photo to open in fullscreen, and expand the top-right menu. If the photo is stored locally, and the photo has been backed up, the Free Up Space option will be visible. 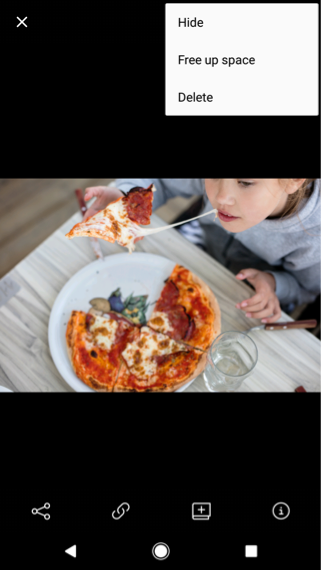 To delete the local version of the photo, choose Free Up Space in the expanded menu. Then confirm the delete by pressing Free Up Space. To start the process of freeing up space for all local media on your device, open the main navigation menu and select "Free up space". From there, a dialog will open while the total number of files that can be safely deleted is calculated. Once the calculation finishes, you will be given the option to start the task. Once the task has started, it can be canceled, but the progress will not be undone. There are a few cases in which the Free up space task cannot successfully complete. In all reported instances this has to do with app or device-level security restrictions. Since Android Lollipop (5.0) write access to SD cards is no longer granted to Android apps, even in cases where the user has granted an app general storage read/write access. The app is however granted read access to SD cards by the same general read access grants that users are prompted to give the Jottacloud app after the first launch, and which the app uses to back up media. This means that your media can be backed up despite the app not having write access to your SD card after starting a Free up space task. If this is the case, the only thing that we recommend for safely freeing up locally stored media is to stop using the SD card for storing media and instead use your device's internal storage. 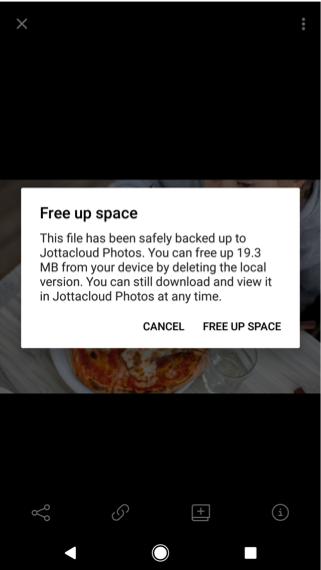 The reason we recommend doing this is so that you can free up device space safely -- with backup guarantees -- from within the Jottacloud app. If, however, this is not an option for you and you still wish to free up space from your SD card, then you must do so by manually removing the photos from the SD card via other means (for example by connecting the device to a computer as a media device and deleting the media from a file explorer). Before doing this, we strongly recommend that you navigate to your timeline on the Jottacloud website and ensure that every file you intend to delete from your device is visible on the website. Because every file being freed is individually checked against Jottacloud, individual files may be unsuccessfully freed up if the connection is dropped during the check. If an individual file fails the check, the task moves to the next one without reattempting. If this is the case, ensure that your network connection is active -- and stable -- and try running the task again.